Loading computer system is a on board software designed to calculate longitudinal strength, intact and damaged stability and to verify the compliance with the criteria required by international rules. with a interface which makes it easy to use. Loading computer system works using a 3D wireframe model of the vessel to execute the required analysis. Hull, tanks and rooms are represented with a sd finite element model at high resolution, which grants accurate and reliable calculation results. Using the 3D model of the ship, we can provide fast and accurate intact and damage stability calculations. A number of loadcases can be created, analyzed and saved. 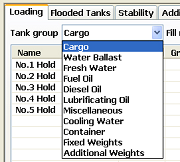 The loadcase allows static weights and tank-fillings to be specified and calculates the corresponding weights and centres of gravity as well as the total weight and centre of gravity of the vessel under the specified loading condition. Loading computer system calculates in real time the set up condition related to the actual edited loadcase and allows you to see on the screen heeled and trimmed hullforms and water plane shapes at the chosen position.